Please be advised that the MCA Community Health Program and Wholistic Health and Wellness Program will be relocating to our newly renovated work spaces from April 17th to April 24th. Please be advised that we are working diligently to restore our telephones and network services which are expected to be fully operational on April 24th. If you experience difficulty with connecting with any of our program staff, please call 613-575-2341. We apologize in advance for any inconvenience to our community members. 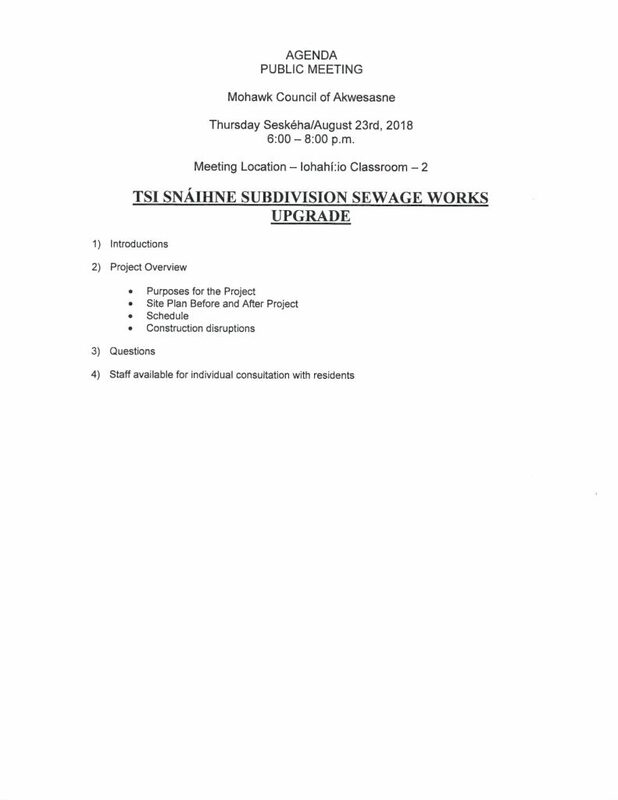 Family members, friends, and concerned community members are invited to a working lunch at Tsiionkwanonhso:te being held on Wednesday, April 17 at 12 p.m. noon. This meal will celebrate maple syrup and includes menu items to reflect the residents’ favorite breakfast items. To save your seat, please RSVP at 613-932-1409 or email vincent.lazore@akwesasne.ca; sonja.sylvester@akwesasne.ca; or aleesha.king@akwesasne.ca. 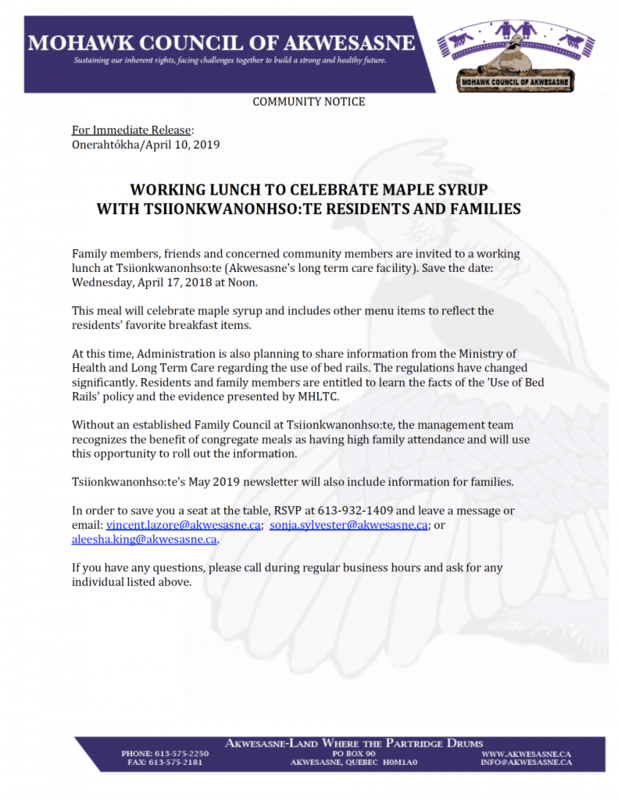 Family members, friends, and concerned community members are invited to a working lunch at Tsiionkwanonhso:te being held on Wednesday, April 17 at 12 p.m. noon. This meal will celebrate maple syrup and includes menu items to reflect the residents’ favorite breakfast items. 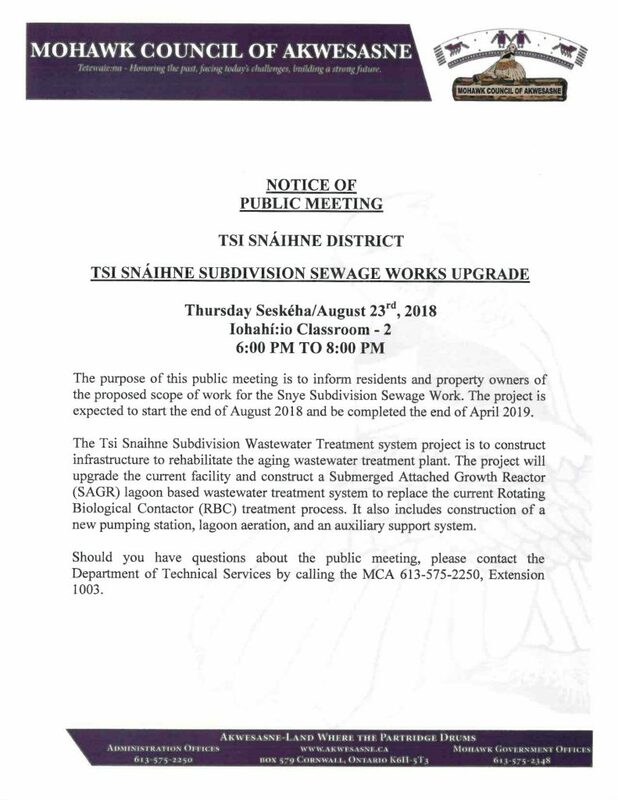 To save your seat, please RSVP at 613-932-1409 or email vincent.lazore@akwesasne.ca; sonja.sylvester@akwesasne.ca; or aleesha.king@akwesasne.ca. 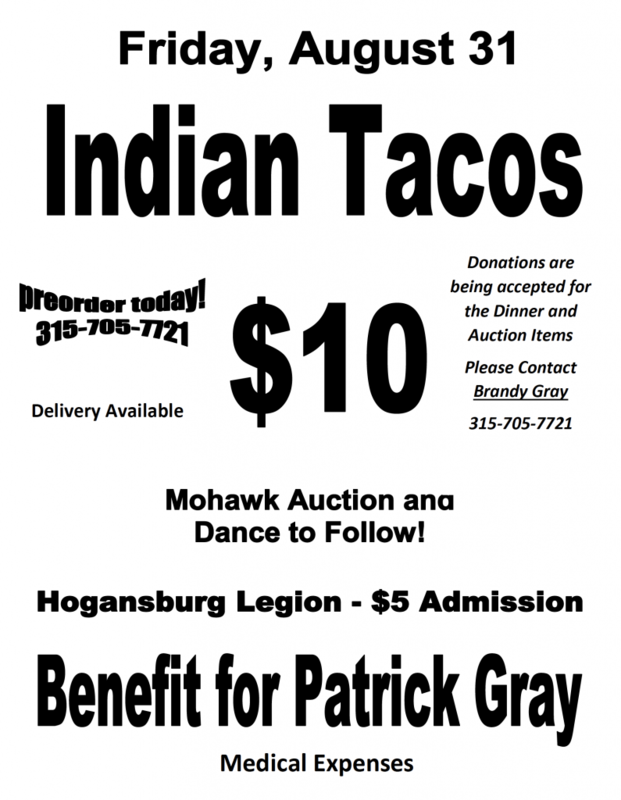 A Mohawk auction, dance and Indian taco sale are being held to raise funds for Patrick Gray’s medical expenses. Akwesasne and the Government of Canada. Following the settlement offer, the parties have continued negotiations on the terms and conditions of a Final Settlement Agreement. In addition to the compensation that will be paid by the Government of Canada, the Mohawks of Akwesasne will have the opportunity to expand their reserve lands by adding up to 18,282 acres of land under Canada’s Additions to Reserve (ATR) policy. The lands will be acquired by the Mohawks of Akwesasne from willing sellers in Quebec and Ontario. Unassisted Online Voting for this referendum will open on Monday, October 1, 2018 at 9:00 a.m. EST and will close on Friday, December 7, 2018 at 5:00 p.m. EST. Referendum Officers will be going Door-to-Door throughout Akwesasne to assist Eligible Referendum Voters with completing their ballots from Monday, October 1, 2018 through December, 7, 2018. Contact the Chief Referendum Officer to schedule an appointment with a Referendum Officer for assistance in Online Voting, or to make arrangements for a Mohawk Language Interpreter or Sign Language Interpreter. or visiting the following website www.akwesasne.ca/referendum. 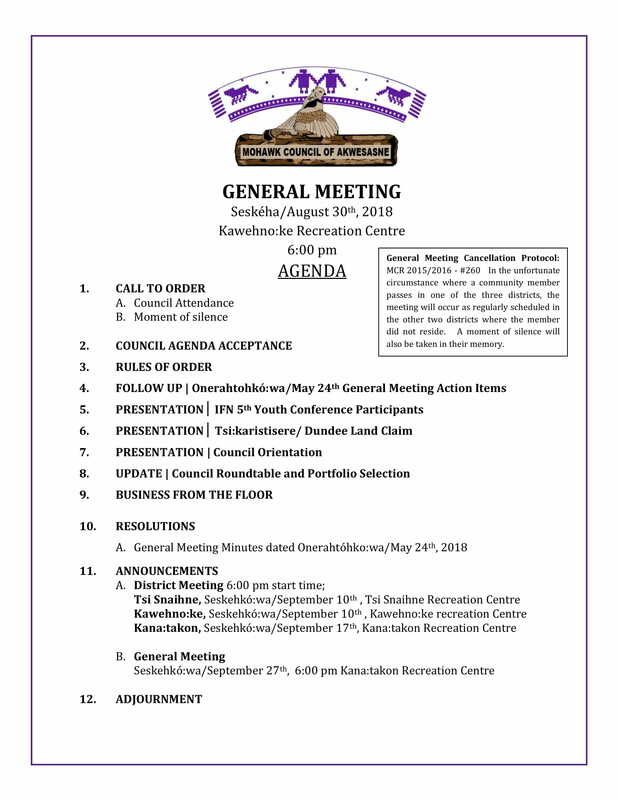 Persons who at the time of voting are Members of the Mohawks of Akwesasne. Persons who at the time of voting have attained eighteen (18) years of age. names to the Referendum Voters List is Monday, September 24, 2018 at 5:00pm. of Akwesasne’s website and Facebook page. The Akwesasne Mohawk Medicine Men, MCA Department of Tehotiiennawakon and Department of Technical Services and our Akwesasne community proudly hosted the 2018 Founder Cup from August 13 – August 18. Nia:wen to all those involved who helped make this lacrosse championship a great success! Saskatchewan, Manitoba, Ontario, Quebec, First Nation Lacrosse Seneca War chiefs and the Mohawk Medicine Men. They played with their hearts and the team that was physically, emotionally and mentally prepared was crowned the 2018’ Founder’s Cup Jr. B National Champions, the Elora Mohawks representing the province of Ontario. Founders Cup meetings began June 19th with the confirmation from the Mohawk Medicine men organization that Akwesasne would be the venue for 2018’ National Jr. B Founder’s Cup lacrosse championship. The Department of Tehotiiennawakon and Department of Technical Services quickly put themselves in gear and were key in ensuring the Arena was ready to host the tournament including installing the turf on July 6th, with the assistance of MCA Chiefs and cooperation of the Canada Border Services Agency and US Customs and Border Protection to ensure passage through the border was with minimal impacts on the traveling public, scheduling of transportation with the assistance of the Akwesasne Mohawk Board of Education for teams from airport and hotel to the arena venue, ensuring the health of players and the public with the assistance of the MCA Department of Health in stationing an ambulance at the Arena during the tournament, ensuring the safety of everyone through the cooperation of the Akwesasne Mohawk Police, obtaining corporate sponsorships and MCA’s Information Services in upgrading the Internet service at the arena to live-feed the lacrosse games. The weeklong event involved increased employment for Akwesasne, provided high-level Lacrosse entertainment, created memories, new partnerships and friendships. The Mohawk Medicine Men organized the tournament, coordinating with all of the teams, providing volunteers during the tournament, assisted in obtaining sponsors, and coordinated with the Canadian Lacrosse Association in holding the successful tournament. On behalf of the Akwesasne Founders Cup Committee, we thank all our sponsors, the Mohawk Medicine Men, MCA District Chiefs, MCA’s Information Services, MCA Ambulance Service, AMPS, Tehotiiennawakon, DTS, AMBE, CBSA, CBP, Ontario East, and the Canadian Lacrosse Association for making the 2018 Founders Cup Jr. B National Lacrosse Championship event a great success! Congratulations to the champions, the Elora Mohawks from Ontario. The Akwesasne Community Settlement Trust has released their annual survey to gather the community’s input on where to utilize the funds for 2019. Take the survey and be entered for a chance to win 1 of 2 $500 Visa gift cards! The survey can be submitted anonymously, but please include your name if you wish to be entered. The drawing will take place in early January 2019. 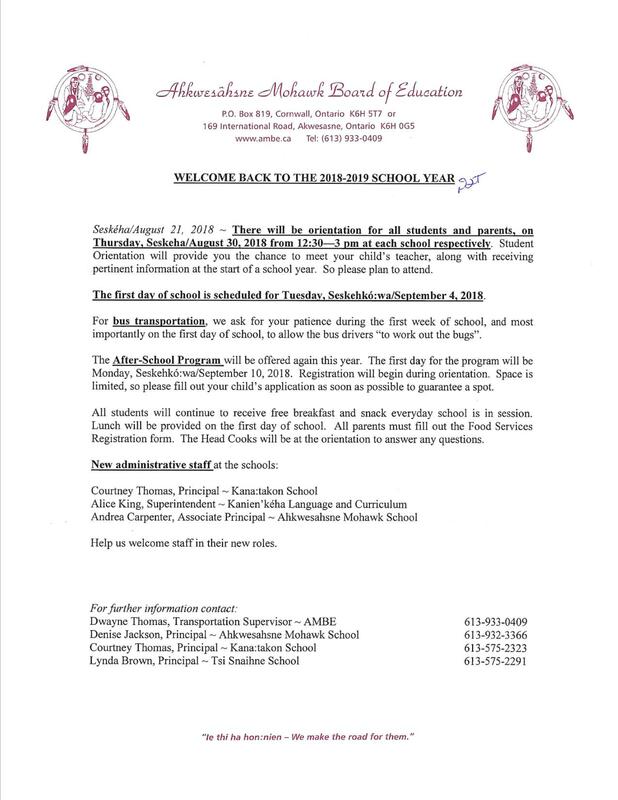 The Ahkwesahsne Mohawk Board of Education would like to inform the community of some important back-to-school information.